MONDAY, APRIL 8 - "Evan Pidgeon is an amazing young man who shows his selflessness on the daily. He is one of the kindest kids I have met since beginning my coaching career, and he is beloved by his teammates." The selflessness quote noted by his 2004 Boys coach, Shane Bufano, was on full display earlier this March when Evan volunteered his time to set up a basketball clinic for young students raising over $250 for the Stefan Pierson Foundation. "I decided I wanted to do this because I really believe in the Stefan Pierson Foundation. I wanted people to think about giving to this organization," noted Evan. Beginning with creating a poster to advertise the clinic, Evan took care of all the adminstrative tasks for his clinic such as registrating all the young athletes, creating training sessions, and organizing all pieces of the clinic on his own. He designed two groups to have the ability to differentiate the levels of play for grades 1-2 and 3-4, where he led various skills training exercises. "I thought it was important to teach two groups because the older kids are able to do a little bit more than the younger ones. With the first and second graders I worked on basic skills to introduce them to the game. I did mostly dribbling, passing and shooting. With the third and fourth grade group we did some harder activities such as the 3-man weave and some spot shooting," Evan explained. 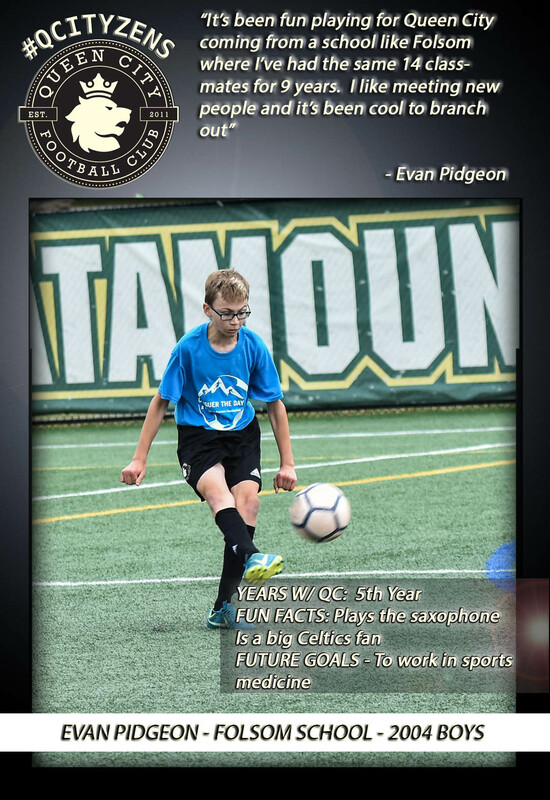 Outside community service projects, Evan is equally impressive as a soccer player for Queen City FC. After the USSF age group change occured two years ago instituting the birth calendar year format, Evan was forced to play with kids above his grade with his birthday late in the year. Playing at Queen City has provided him a unique experience, “It’s been fun playing for Queen City coming from a school like Folsom where I’ve had the same 14 classmates for 9 years. I like meeting new people and it’s been cool to branch out." Small in stature, Evan often deceives opponents with his crafty footskills, as he dribbles passed larger/older defenders. Currently, he is playing in the Varsity League with our older Queen City boys team in the Far Post Futsal League as an 8th grader. Coach Nunez, who works with the high school group has been impressed with his ability to play with the older boys, "Seeing Evan frequently dice up much bigger juniors and seniors on the futsal field as an 8th grader is really fun to watch." Outside the playing fields, Evan is a great student while also participating in band (he plays the saxophone). He is a big Celtics fan, and hopes to one day work in sports medicine.